The New England Patriots continued one of the region's cooler, yet lesser-known traditions, hanging a jersey for every New England high school state champion in The Hall at Patriot Place, the team's Hall of Fame and Museum. That means all eight MIAA state champions crowned Saturday will have a jersey hanging in the same building as some of the greatest players in NFL history, Patriots quarterback Tom Brady headlining that group. The Hall will also honor the jerseys of state champions from each state in New England, along with five prep school bowl winners and select Pop Warner champions. 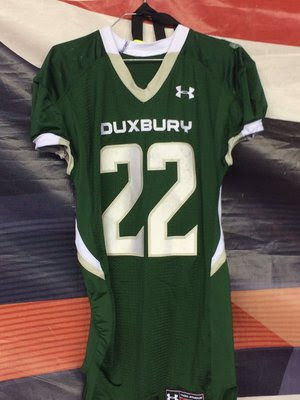 For MIAA Division 2 Super Bowl champion Duxbury, it was senior running back Devin DeMeritt's jersey chosen to be honored by the Patriots. The honor comes after the Dragons captured the D2 state championship with a 40-7 win over Shrewsbury at Gillette Stadium Saturday night. 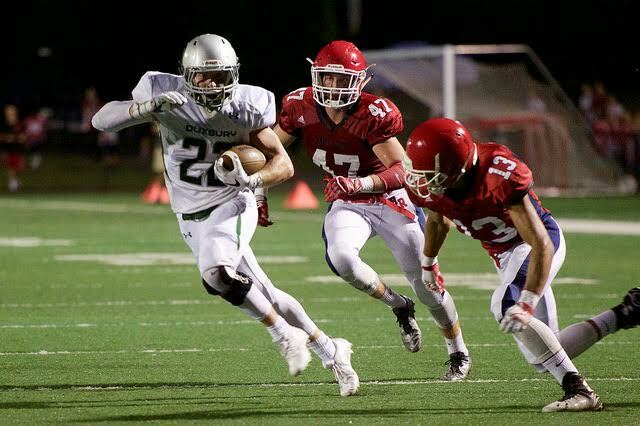 While many casual fans know about Duxbury quarterback Bobby Maimaron's historic career, and about Ryan Reagan's impressive receiving skills, DeMeritt was one of the better stories and players in the state this year. DeMeritt, an all-purpose running back, bounced back from a torn ACL to help tie together the Dragon offense in 2016. Rushing for over 1,500 yards and 25 touchdowns on an absurd 21 yards per carry, DeMeritt was both a homerun threat as a runner, and instrumental part of Duxbury's passing game, both as a receiver and a blocker. DeMeritt hopes to continue his career at the next level, and is currently hearing from a number of prestigious FCS programs, including Georgetown, New Hampshire, Holy Cross, Villanova and Yale, while in-state FBS programs UMass and Boston College continue to monitor the senior star. You write this Joe, or did Devin's Dad's PR firm write it? That said, I'll gladly write something up on any of the other kids who had their jerseys honored, this was just the only one I was made aware of. even make it to Gillette, but then to take the crown? Tremendous!! What a fun season to follow.